The Mazda MX-5 production race car finished third in class in round four of the Britcar Dunlop Production GTN Championship 2011 at Thruxton Circuit on Sunday 12 June 2011. 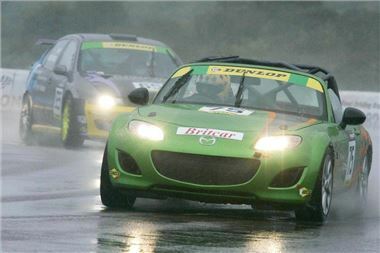 Despite qualifying a lowly fifth in class on Saturday 11 June 2011, the Mazda Financial Services and Motul backed Mazda MX-5 production car demonstrated its outstanding wet handling strengths to finish third in class. On race day, despite adverse weather conditions causing poor visibility and heavy traffic on track, the Mazda MX-5 production race car out handled rivals Honda Civic Type R, Ford Focus, Seat Leon Cupra and Honda Jazz to give the production car its first podium of the season. Mazda driver Mike Wilds started the race and handed over to freelance motoring journalist, Jesse Crosse at the half way point. The Mazda MX-5 production race car proved highly competitive in the conditions– thanks to its 50:50 weight distribution, handling and performance. Also entered by Mazda was the MX-5 GT race car - driven by Mark Ticehurst, Mazda works driver and Owen Mildenhall, racing driver and motoring journalist – and despite poor track conditions, the MX-5 GT led its class for the first half of the race, climbing to fifth overall chasing two Ferraris before an electrical fault saw the car recovered to the pits. The electrical fault was traced to water in the MX-5 GT race car’s cockpit, and Owen Mildenhall rejoined the race 15 laps adrift of the class lead. After almost an hour and 10 minutes into the two hour race, the conditions were considered bad enough for the race to finish early and the GT race car finished fifth in class. “Despite adverse weather and Thruxton circuit lending itself to the faster cars on track, we had a great result on Sunday, which is testament to the drivers and the handling and reliability for which the MX-5 is renowned,” commented Graeme Fudge, PR director, Mazda UK. The next race is at Spa Francorchamps on 26th June 2011.